Citron is a citrus fruit that resembles a lumpy lemon. Unlike lemons and oranges, however, citron is used primarily for its zest, since its pulp is dry and contains little juice. It is prized for the essential oils in the outer rind (flavedo), which are especially fragrant and believed to have antibiotic properties, as well as its pith (albedo), which is often candied for succade and used in baking, particularly around the winter holidays. Another popular use is infused vodka. 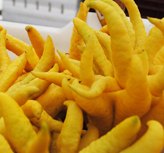 The pulp-less, many-tentacled Buddha’s Hand citron is almost all peel, with a pith that is not bitter, unlike most citrus fruits. Keep your eyes peeled for citron in the winter months.